Scrolling through Pinterest one day, I saw that someone had pinned a Pottery Barn condiment set photo. I liked it right off the bat- a cute wooden drawer filled with clear glass jars, perfect for parties or events. The original condiment set is no longer sold (to my knowledge), but in fairness to Pottery Barn, these are their similar current offerings. It also occurred to me immediately- as it probably has done to a few other folks- that this set isn’t something you have to buy. 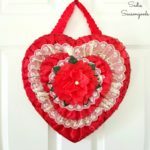 Rather, it’s something that you can easily recreate with what you already have or find at a secondhand shop. This post contains affiliate links for your crafting convenience. Well, I’d been meaning to purchase a library card catalog drawer (or sewing table drawer) for a while now- I mean, who doesn’t love those?? So I found the perfect one and when it finally arrived in the mail, I knew it was perfect for my own DIY condiment set (which I intended to use for a hot chocolate bar). Once I had the library card catalog drawer, I had to decide what to fill it with. Mason jars would have been an obvious- and popular- idea. And I love me a mason jar…but I wanted to think a little outside the box…or drawer, as the case may be. Carnival glass? Silverplate goblets? Pretty colored sherbet bowls? Let’s face it, the vintage options are endless. In the spirit of the last days of winter, I decided that classic vintage milk glass would be lovely. Courtesy of Olde Faithful’s Antique Mall, I ended up with two sugar/creamer sets- I loved the different patterns and heights. Perfect to hold all my favorite hot chocolate toppings! The vintage milk glass white really pops inside the dark wood of my library card catalog drawer, doesn’t it? It also has a winter decor feeling, which is perfect since I plan to use it for a simple hot chocolate bar! The milk glass will hold all the hot chocolate toppings (or ice cream toppings would work, too). Also in the spirit of winter’s final moments, I decided that instead of using my condiment set for BBQ sauces (a la Pottery Barn’s pretty picture), I would use mine for hot chocolate bar toppings as a simple hot chocolate bar. So I filled up my milk glass pieces with sweet deliciousness…and you know what, I’m pretty darn pleased with it! Since labeling everything is all the rage, I added little chalkboard labels or chalkboard tags. To keep things as easy as possible, I used a chalk marker to label each of my hot chocolate toppings. Perhaps my hot chocolate bar didn’t actually *need* any labels, but depending on which hot chocolate toppings or ice cream toppings you use, labeling could be handy! Especially if any of your toppings or condiments are specialized, like gluten free, vegan, or sugar free. And there it is- easy as can be using all things vintage or secondhand. Here’s a little side-by-side comparison of the Pottery Barn condiment set versus my hot chocolate bar in a library card catalog drawer. And please ignore the fact that Pottery Barn has a far better photo!! Focus on the fact that my version is genuinely vintage, not recently made in China. Anytime I can use secondhand things, I’ll do it! My first official hack…I love it!…but back to real projects next time, I promise. 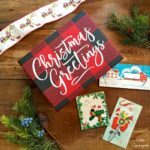 And please check out my full collection of holiday project ideas or more festive inspiration during Christmas time. Seeing this post-holidays? Have no fear- I’ve got all the upcycled winter decor project ideas you need right here to create a cozy home during the colder months! What a fun idea – I already have the pieces for this. Would be so cute for a pot-luck dinner! I’d love to, Katherine! Please send me a link to the site, and the day/time/time zone that your link party opens up!! visiting from teriffic tuesday linky… now that is a neat idea! 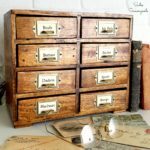 I see these catalog drawers from time to time and love them, but can’t think of anything to do with them so I don’t buy them! Next time I will buy! It could do the same thing for a jewelery caddy thingy..instead of the condiments in the cups..jewelery! Where do you buy the drawers? This one I found on Etsy years ago! What a fun (and yummy) idea! Thanks for sharing it at the Vintage Inspiration Party! This is so cute! I have a long wooden tray on my dining table which holds vases. It would be perfect for condiments but I would have never thought of it before seeing this. Thanks for the inspiration! Found you via Inspire Me Wednesdays. What great use of an card catalog file. I love how you made it into a hot chocolate bar. Thanks for linking up this week at #HomeMattersParty linky. Looking forward to seeing what you link up next week. I love it! And I love the vintage wooden container you used – beautiful! Perfect vintage style! I love the condiment holders. The white is so pretty. Pinning and sharing. Thanks for sharing at Totally Terrific Tuesday last week! Can’t wait to see what you have lined up tonight! Great hack! Love those drawers. And I agree genuinely old is so much better than made in China. And much more environmentally friendly too. Thanks for being such a loyal linker upper at the VIP! Thank you so much, Marianne- love your party!! What a fun idea! I always see those at the flea market too. Thanks for linking up at Found & Foraged! So cute! I love it! Thanks so much for linking up with Idea Box! Love this project Sarah! Catching you! Thanks, Gail! See you shortly at the party! I love ideas like this! Old drawers are so fun. 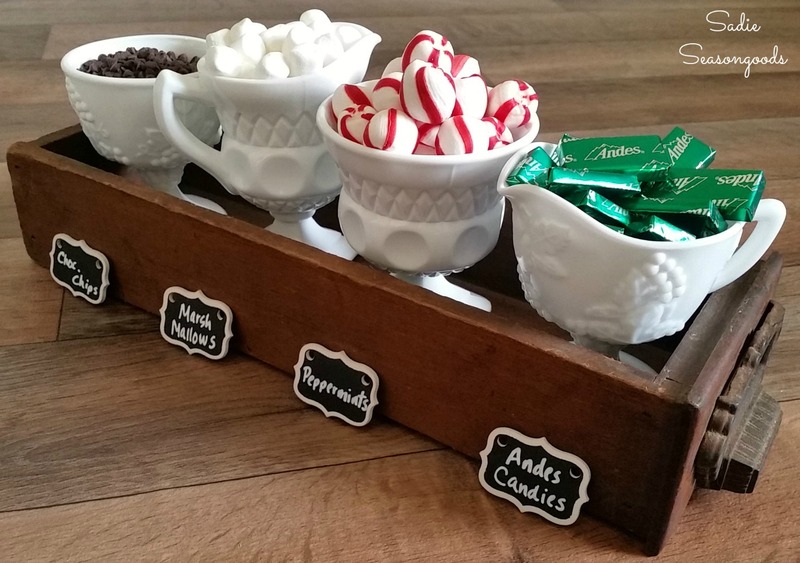 I used an old sewing machine drawer to corral things for my hot chocolate bar during the winter and loved it! Thanks for sharing with SYC. What a great idea! So much you can do with this.